The PANDA collaboration has the pleasure to inform you, that Joachim Stroth (Spokesperson of HADES) on behalf of HADES and Klaus Peters (Spokesperson of PANDA) on behalf of PANDA have jointly signed the Memorandum of Understanding between their collaborations for a successful cooperation on the respective FAIR Phase-0 project to the benefit of all involved parties. 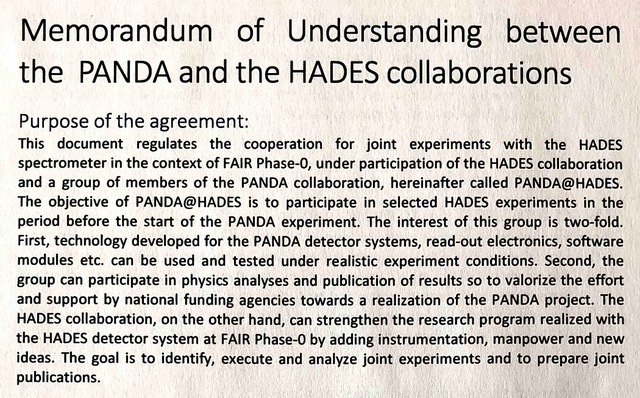 This document regulates the cooperation for joint experiments with the HADES spectrometer in the context of FAIR Phase-0 under participation of the HADES collaboration and a group of members of the PANDA collaboration, herein after called PANDA@HADES. The objective of PANDA@HADES is to participate in selected HADES experiments in the period before the start of the PANDA experiment. The interest of the group is two-fold. First, technology developed for the PANDA detector systems, read-out electronics, software modules etc. can be used and tested under realistic experiment conditions. Second, the group can participate in physics anlaysis and publication of results so to valorize the effort and support by national funding agencies towards a realization of the PANDA project. The HADES collaboration, on the other hand, can strengthen the research program realized with the HADES detector system at FAIR Phase-0 by adding instrumentation, manpower and new ideas. The goal is to identify, execute and analyze joint experiments and so prepare joint publications.